Following its success with the "Velvet 26" the Tecnomar boatyard in Viareggio completed its range of so-called coupé yachts by commissioning Luca Dini and Roberto Zappelli to design the Velvet 110 Open. The hull is in composite while the main deck is in fibreglass and polyurethane foam sandwich. The main deck houses the bridge and is the space for open air activities while the lower is the night-time area. The deckhouse is far forward in the longitudinal plane, thus ensuring room and comfort for cockpit activities. There is a spacious sundeck forward while the cockpit has two facing sofas with a coffee table in between, a sundeck aft and an outdoor galley. On the platform there is a hydraulically controlled access hatch to the tender hangar and a davit for launching and heaving aboard. The wheelhouse is inside the deckhouse and is equipped with three ergonomic seats and all necessary instrumentation for offshore sailing. There is a saloon aft of the bridge with two sofas, two coffee tables and entertainment accessories such as a stereo system and a 50" plasma screen for video and DVD, plus the dining area with table and chairs. The owner's, guests' and crew's cabins are on the lower deck. The owner's has a double bed, wardrobes and private bathroom, a hi-fi system and a 20" flat screen television. There are three guest cabins: two with twin beds, private bathroom and multimedia systems, and one VIP suite with queen size bed, TV, hi- fi and private bathroom/toilet. 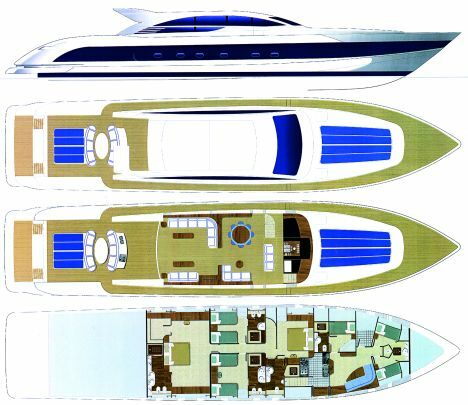 The crew area consists of a dinette (with sofa, dining table, hi-fi system and TV) and three cabins. The skipper's quarters have a double bed and private bathroom while for the crew there are two cabins with bunk beds and a shared bathroom. The service area is complete with all the accessories useful on a long cruise such as a laundry and a spacious galley with freezer, fridge and pantry. The interior is finished in fine fabrics and wood selected by the owner. The exterior design is aggressive, featuring a sliding hard top on the deckhouse and a broad roll bar. Her waterlines are designed for high performance and to guarantee that comfort under way which is indispensable to vessels of this size. The boatyard expresses performance as a maximum speed of 30 knots with two 2.285 HP MTU engines. For further information you can contact: Tecnomar, Via Virgilio 220, 55049 Viareggio (LU); tel. +39 0584 392901; fax +39 0584 392902; website: www.tecnomar.com; e-mail: info@tecnomar.com. Fuel capacity: 10.000 litres approx. Declared maximum speed: 30 knots.